The Tigers offense got shutout and they never knew what hit them. A rookie pitcher took the mound, pitched a stellar game and matched up well against one of the best pitchers Major League Baseball. 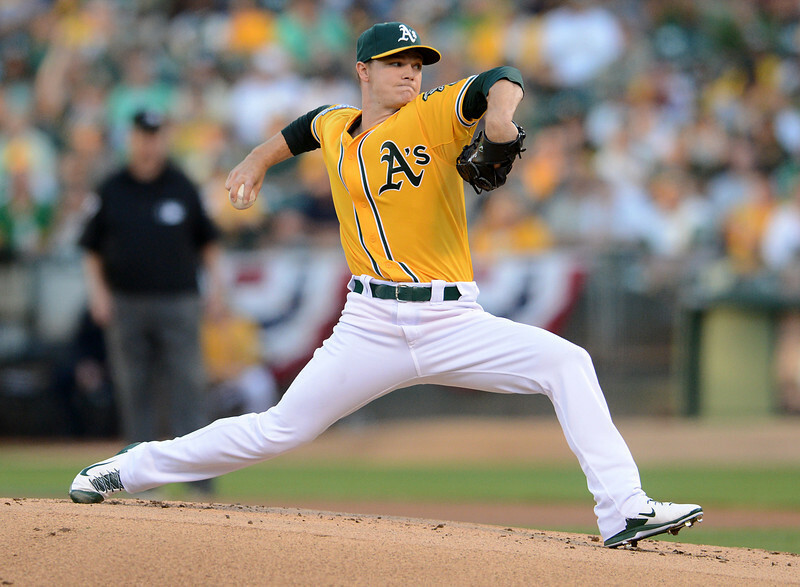 Sonny Gray got his first career postseason start and win. The A's evened the American League Division Series with a 1-0 walk-off victory over Detroit in this best-of-five series. But before the pies came out, Gray and Justin Verlander battled it out on the mound. "Yeah, well, he was real aggressive with electric stuff," said Tigers manager Jim Leyland. "He didn't back off at all. He was very impressive. He came right at us. That's what the report said, they said he would go to his curveball when he got in trouble, which he did." Sonny tossed eight frames, scattered four hits and fanned nine while allowing not one run. Pretty good for a rookie whose only 23 years old. He struck out the side in the third frame while facing Detroit's top three hitters in Austin Jackson, Torii Hunter and Miguel Cabrera. After a pitch to Hunter, Gray's pitches jumped to 96 mph a few times and which got him into a better rhythm. Torii wasn't pleased with his inside fastball and pointed directly at him with the sellout crowd booing loudly. It was that moment, when Sonny got better. "He's been one of my favorite players growing up," Gray said. "I remember my first Spring Training facing him when he was with the Angels, he hit a line drive up the middle and it almost took my head off. He is known as a really great guy and it got me fired up a little bit. It did, after that I had a little extra adrenaline, I really did. I was still able to locate the ball though, so that was what it was." "That was a reaction because it came up and in, yesterday it almost hit me in the face and today to," explained Hunter. "I was like 'hey, hey pitch in but don't go up and in'. I tried to get in his head and piss him off. That kid has great stuff. He's definitely ahead of us. We've never seen him before, we didn't know what his fastball, curveball, slider or changeup looked like. It's awesome I'm one of his favorite players and... I forgive him." Verlander met his match, the last time he took the mound against Oakland was game 5 of the ALDS and he pitched his team to the World Series. Tonight, was a different outcome but Justin was still dominant after he retired the first 11 batters he faced before allowing a single to Josh Donaldson. "He pitched like Josh Beckett and Curt Schilling," said Cabrera. "Wow, that fastball, that breaking ball. Man, he was good." "It felt really good from jump street, right when I was throwing in the bullpen," Verlander said. "In particular my curveball had benefited the most along with my fastball command, but my last three or four starts with adjustments I made, that is the thing that is glaring to me the most is how my curveball responded." The Tigers relied on video and scouting to try and figure Sonny out. The same offense that took advantage of errors made by the A's last night failed to muster a single run while leaving runners stranded. The one opportunity Detroit had to score was stifled by Oakland's defense to force a double play. With two on at third and first, Gray walked Omar Infante and gave up a single to Jose Iglesias. Jackson came to bat with one out, Gray struck him out and Iglesias was thrown out trying to steal second. That was the closest they came in scoring a run while Sonny escaped the jam and walked off the mound to the crowd on their feet chanting his name. "He had a good explosive fastball, and curveball," said Austin who struck out four times. "He made some big pitches in tough situations. From the beginning of the game it looked like he'd been pitching in the big leagues for a long time, he didn't look like a rookie. We had a few opportunities but he got out of it." Heading into the bottom of the ninth, Tigers reliever Rick Porcello loaded the bases with no outs. Al Albuquerque gave up back-to-back singles to both Yoenis Cespedes and Seth Smith. Porcello intentionally walked Josh Reddick and that brought up Stephen Vogt who previously struck out three times against Justin. He knocked a single to center field for the walk-off win. "It's the moment that every kid dreams of," said Vogt. "I remember playing in my front yard with nobody else, imagining hitting a walk-off hit in a playoff game. It's everything you could ever dream of and more." "You expect more high-scoring games based on both offenses," A's manager Bob Melvin said. "But pitching can rule the day."